Should you Adopt a Pet Rottweiler? The Rottweiler (Rotti) is a Working Dog Breed and has a long history as a working dog. They have been used for carrying wood and other heavy packages. This century they have been used more as guard and police dogs. In more recent years they have become a very popular pet. They gained popularity due to their good looks, loyal disposition and playful attitude. Weighing as much as 110 pounds (50 KG) and standing as tall as 27 inches they are a large dog breed. They are muscular and have a face that can go from friendly to intimidating in a moment (their teeth are huge!). Their power and learning ability make them a great choice as a guard dog. 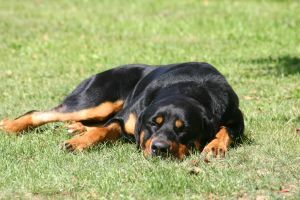 A Rotti can also be a great companion for a responsible owner who devotes time for socialization and plenty of training. If you adopt a pet Rotweiler you need to be ready to invest in good obedience training because their natural tendency is to be dominant and possibly aggressive. If you are a lover of Rotti's please don't get me wrong. I love them too. I have enjoyed meeting many wonderful, adorable, playful Rotti's. I just hate to see people adopt a pet that isn't right for them. A dog as large and powerful as this requires an owner ready to commit to socialization and training. I feel that the "bad dogs" are most often a reflection of their owners lack of attention (or ability). And of course, some bad dogs are a result of poor breeding. In addition to the investment in training they have a large appetite and veterinary care is a must. They are easy to groom. Just a brushing is required – which is easy due to its coat. Like most active dog breeds they need exercise and mental stimulation or they could get aggressive. The exercise also helps them to keep their weight down – reducing the chance of joint and skeletal problems. I do not recommend a Rotweiler for someone who has never owned a dog. The level of training and socialization required must be strongly considered. For someone who has owned a pet dog before the Rottweiler can make a loyal, protective and loving addition to the family.